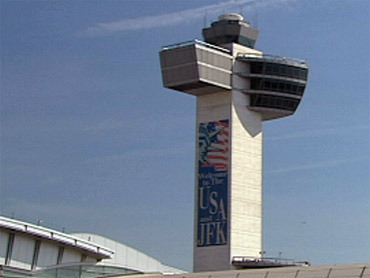 The Federal Aviation Administration is investigating how a child was allowed to direct air traffic at the nation's sixth-busiest airport - New York's JFK International. And an FAA official told CBS News Wednesday that the agency learned during its initial investigation that the same air traffic controller, Glenn Duffy, brought a different child, presumably also his child, into the tower the following night. CBS News Correspondent Kelly Wallace reports the first incident, on Feb. 16, involved a child on the radio to pilots of planes awaiting takeoff. The boy was allowed to make at least five transmissions to commercial jets. Boy: AMX 403, Contact departures. Adios. Pilot: Contact departures. Aeromexico 403. Adios. An adult -- reportedly a controller -- made sure the pilots were in on the joke. "That's what you get guys when the kids are out of school!" the adult says on the tapes. Boy: Jet Blue 171 cleared for takeoff. Pilot: Cleared for takeoff. Jet blue 171. Boy: Jet Blue 171 -- contact departures. The child's voice heard on the 17th sounds younger than the first and the child's interactions with pilots was much more limited than in the first incident. In a statement, the FAA says, "Pending ... our investigation, the employees involved in this incident are not controlling air traffic. This behavior is not acceptable and does not demonstrate the kind of professionalism expected from all faa employees." The FAA confirms to CBS News that the two employees who have been suspended are the controller who brought his son into the tower (the FAA confirms it is his voice on the recording) and the supervisor who "tolerated" the incident. The National Air Traffic Controllers Association says, "We do not condone this type of behavior in any way. It is not indicative of the highest professional standards that controllers set for themselves and exceed each and every day in the advancement of aviation safety." Air control towers are highly secure areas, Wallace points out, and it's still not clear how this could have been allowed. CBS News Travel Editor Peter Greenberg says, "You're dealing with two separate violations here: access to the tower itself, and access to radio frequencies. And you're dealing with a potentially dangerous situation. … The bottom line here is any air traffic controller on the ground in that particular case who was handling departure control would be multi-tasking, talking to more than one pilot at the same time. In order for his son, or whoever the kid is, to make those radio calls, he had to relinquish control of the microphone and stop talking to those other pilots. "You're talking about multiple runways with both departure and approach, and one miscue can lead to disaster. The good news is, of course, if there is any good news out of this, is that this happened on the ground, and not at an air traffic control center, where you're dealing with many more planes in the air in terms of aircraft separation." Usually, says Greenberg, "No one has an opportunity to talk on that microphone other than a licensed air traffic controller.
" ... Ironically, this incident happens at a time when the air traffic controller staffing levels are at a 16-year low. This is one silly way to actually promote that incident."